Everybody needs to let their hair down every now on then and on Friday evening we did just that with a fun-filled night at the Ladyboys of Bangkok* who will be in Newcastle until Saturday 5th October. Amazingly, the Red Hot Kisses tour is the ladyboys' 16th season touring the UK! Far from getting old though this is a brand new show that has something for everybody. The show features a spectacular 200 costumes and really is a feast for the eyes! There is music across all genres from Dolly to Kylie and Katy Perry and from Tina Turner to Robbie Williams and Nicky Minaj. You are guaranteed to be up on your feet dancing by the end of the evening. The show is performed inside the very glamorous Sabai Pavilion which has been erected inside of Newcastle's Time square - very conveniently located just 2 minutes from central station. There are a choice of bars, a resident chef serving up delicious thai food, a thai-style boudoir and even a luxury outdoor courtyard should you need to cool off. I watched the show with three friends and we all could not believe our eyes. The cabaret-style show is performed by 16 absolutely stunning showgirls who just all also happen to be men! They have to be seen to be believed. The show has been designed for over 16's and there definitely are some rather risque elements. It is not necessarily the sort of show you would take your grannie to see but is fantastic fun for groups who are up for a giggle (and it is never too crude). Be warned though, if you are sitting near the front, keep your eyes out for Ole as she enters the crowd for volunteers on a number of occasions. One of our favourite parts of the show was the 'music from the movies' section. Sak had the crowd in fits of giggles and the sketches and cabaret performances from hairspray, dirty dancing, Bridget Jones and more really got the crowd in the party mood - every table was up singing and dancing along. Another highlight of the evening for us was the ladyboys tribute to Amy Winehouse - the resemblance was absolutely uncanny. The party really got going towards the end of the show with dancing on podiums in the crowd, men dancing on the bar and some of the crowd being invited up on stage to get their grove on. If you want to let your hair down with the girls - I really cannot imagine a better place to do so. The show lasted for 2 hours in total including a short interval - we opted to watch the earlier performance so we could enjoy a few drinks in the nearby bars afterwards. 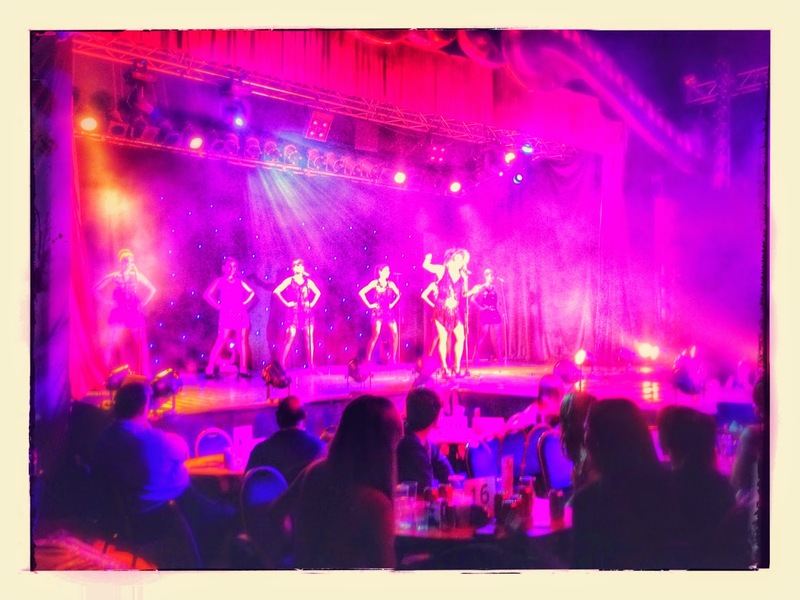 Two hours of comedy, dancing and fun with the ladyboys is fantastic value for money and really is a great night out. Tickets to the show start from just £11.75 each or bought directly from the ticket office outside the Pavilion. You can also really spoil yourselves and make the night special by addding a choice of treats to your evening including sparkling wine, photographs and even feather boa's. The show continues in Newcastle until Saturday 5th October - make sure you book a ticket before it's too late!